Zoram is another critical element of this narrative. Once again, we learn later in the Book of Mormon that there was controversy concerning Zoram’s departure from Jerusalem and joining Lehi’s expedition—enough controversy to eventually fuel a serious political movement and secession (Alma 31-35). It’s another instance of Nephi portraying himself as heroic, faithful and possessed of a liberal spirit. One certainly hopes that Lehi’s later blessing of Zoram corroborates Nephi’s account—but Zoram’s joining the Lehite project is another oddity. Why does Zoram join them so readily? He was from the lower classes, perhaps made naturally compliant on account of his life circumstances. He might well have felt compelled or lacking better alternatives. I suspect that this is where Nephi’s murder is revealed. I imagine a terrified Zoram asking what Nephi (who is “large in stature,” and this time the description is obviously physical—he’s just physically restrained Zoram from fleeing) what he did with his master Laban and how he had gotten Laban’s clothes and sword. Nephi’s brothers surely had the same question. Facing the question, and aware of how conspicuous his wearing of Laban’s clothing was, and particularly given the dramatic nature of the night’s events and the effects this would’ve had upon an exhausted young Nephi, it’s plausible that he straightforwardly confessed. It’s easy to picture Zoram, physically restrained by the “large in stature” Nephi, who has just explained to the group that he murdered Laban, feeling like he had no choice: go submissively or face the wrath of a physically large and unknown, self-proclaimed murderer. However Zoram felt (both at the time and later on), it’s quite easy to see how this story could be politically exploited by later, nationalistic secessionists. Another conspicuous oddity occurs with Zoram leading Nephi to get the plates. Zoram speaks many times concerning the elders of the Jews. This seems natural enough. But why would Nephi mention it? Why remark on their conversation at all? He mentions it three times in fact. What did this mean to Nephi’s audience? We of course can’t know. My best guess is that it demonstrated a sort of street cred possessed by the later, older, friend-of-Nephi Zoram. Perhaps Zoram’s knowledge of the elders of the Jews lent credence to Lehi’s narrative, and likewise (indirectly) to Nephi’s. Nephi never murders anyone. I feel until one realizes that they will misunderstand the story. The killing of Laban was a lawful killing. Its obviously in both Zorams and Nephis interests that Zoram go with Nephi and his family. I perceive Zoram to be a good and loyal person. Someone with more time and creativity than I have should give James’s posts the same “close reading” treatment that he gives Nephi’s narrative. Only, don’t be as quick to identify James’s wickedness as he is to identify Nephi’s, because that would probably violate the rules of netiquette. I really want to thank James for doing this project. I’m learning a lot. I have tended to read discrete sections of the BoM for a while now without actually reading the entire thing from beginning to end but James method gives me a good reason to do that again. I’ve generally not had a lot of concerns about Nephi killing Laban, been somewhat concerned about the killing committed by Moses (I know we lack a lot of facts and I’m hopeful that the facts show Moses in a good light), and had a lot of concern about Saul/Paul’s role in the death of Stephen. That makes some sense to me. Laban was a bad guy. Don’t really know about the guy Moses killed, but it’s easy for me to assume he was a bad guy. Stephen is one of my favorite NT prophets. I also really struggle with the story of Abraham and Isaac. If I told my bishop that God had told me to kill my only son, I certainly hope that he’d call 911 and have me arrested immediately. I’m now looking at this differently. I struggle with the assertion that the killing of Laban was lawful. I just don’t see the legal justification. I think Welch is right when he argues that this is manslaughter rather than murder, but manslaughter is not a lawful killing. I need to think more about that. From a legal standpoint, I think (without thinking much or studying up on it) that Stephen’s death was an execution after a legal trial (albeit a trial that went horribly awry). I also take some comfort in the fact that Paul was only peripherally involved in his death. The essence of the law is applying the same ruling to the same facts but also being able to differentiate between scenarios that seem similar but aren’t. Like James, I’d like to have something more than “God told him to do it”. That was basically Ervil LeBaron’s defense and none of us buy it (it’s also the defense used by many terrorists, i.e. God told them to do it). I know that there is a difference between God actually telling Nephi to do something and LeBaron just using it as a wholly unjustified defense, but I’m inherently uncomfortable in living in a legal system where the judge primarily determines the veracity of religious claims. Anyone really want the main job of the US Supreme Court to be to determine whether or not the claims of Mormonism are true? I agree with Rob, that the issue of whether Nephi’s killing of Laban constitutes “murder” is not necessarily clear. But I also disagree with the suggestion that it being a lawful killing is cut and dried. There are good arguments on both sides. But I don’t think that’s the point of James’ post here. James is, I think, using “murder” and “murderer” as a synonym for “kill” and “killer.” Sure, we can dispute whether Nephi’s killing of Laban was “murder” or whether it was just “killing,” but either way, I think James’ point still holds: it is certainly plausible that Zoram, being physically restrained by a large man who just admitted that he killed his master, may have felt like he had no choice but to give his consent, and regardless of whether Zoram truly consented or not, the facts are certainly such that it was easy for later groups to argue that he was “pressed” and did not give true consent. N. W. Clerk, isn’t what you and Rob are posting exactly examples of doing just that? James, I’ve long been fascinated by Zoram. I’m never quite sure what to make of him. First off exactly how Nephi (who is presented as quite young) can impersonate Laban seems dubious or at least miraculous. It’s not presented as miraculous by Nephi (see vs 21). So at minimum Zoram clearly isn’t in the inner circle of Laban and presumably hasn’t really seen him before. Yet having the keys of the treasury seems a pretty important job. So something really odd is going on here. Of course when Nephi’s brothers see him they think it’s really Laban as well. Again this seems a bit odd. It may mean that Nephi is much older than we suppose. Or it might just be they’re scared when people show up in the dark who aren’t obviously Nephi. Or Nephi might be exaggerating a tad. The way Nephi calms Zoram has been commented upon quite a bit. Nibley reads it in terms of “desert peoples.” But would servants in a treasury in Jerusalem be “desert people?” I can see an argument for Lehi maybe. But Zoram? I think Nibley’s correct that this only makes sense if Zoram isn’t too keen in staying in Jerusalem. That might be because of the obvious geopolitical issues. (Let’s not forget Babylon’s siege and sacking of the temple is fairly recent) It might well be because he worries he’ll be blamed for the loss of the treasure and killing of Laban. My question with Zoram is why he stays with the Lehites so long. It’s one thing to leave with them. It’s quite an other to effectively join their clan. I think commentators see this in terms of the oath but there must be more. The entire narrative fails without faith in believing Nephi was commanded by the Lord to slay Laban. This wasn’t a revenge killing where Nephi the tried to justify it by invoking the line “God commanded me”. If it was the spirit would have ceased to strive with Nephi and he really would be a murderer and the rest of his story would be a fabrication of lies. At that point we could just chalk Nephi up as a murderer and wicked man who really did seek dominion over Laman and Lemual to rule over them unjustly. We must read the text exactly as it states and have unwavering faith in Nephi and his account of events from his perspective as being true. We are thus led to believe that Nephi is their true leader because of his loyalty, honesty, and faithfulness in obeying every command of the Lord. It’s sets forth the example that later leaders will use to continue the tale of the Nephites. Even so much that wicked leaders do not contribute to the record. Zoram is fascinating. I’ve always assumed that from that night on he was always treated well enough by Nephi and Lehi to always feel like a trusted member of the clan and that he had an unusual degree of loyalty (analogize to various figures from literature or history). I have always assumed that Ishmael’s oldest daughter (Zoram’s future wife) did help seal the deal. I’m sure that the Lamanites hated Zoram and attacked them in their political narrative and I expect even the Nephites tended to treat Zoramites like second class citizens (there are passages in the BoM about being a direct descendant of Nephi which strongly suggest that did convey special social status). We also know that the Nephites are quickly outnumbered by the Lamanites and we can only assume that that would have ben much worse (i.e. much more dangerous) without Zoram’s seed as an ally. I’ve always pictured Zoram as being a confidant and trusted adviser to Nephi, in some ways the oldest brother that Nephi never really had. I’ve also assumed that at least part of Nephi’s defense of his actions against those Lamanites and others who basically argue that Nephi killed Laban in cold blood and stole the plates is that Zoram was there and he did not see it that way. Zoram, through no fault of himself gets put into a sticky predicament. What are his options? I think he naturally was not thinking or able to think rationally when he finds out Nephi has killed his master. The text states that Zoram was trembling which is also a sign that his mindset is probably also thinking irrationally. His loyalty automatically is in his instincts to turn away and turn Nephi in. Nephi holds him, speaks rationally to him promising him his freedom and his life if he comes with them. Fast forward 24 hours now and imagine what’s happening in Jerusalem- everyone knows Laban is dead and detective work has exhaustively started. They know Zoram is missing along with the plates of brass of which Zoram was in charge of. At this point he is, by no choice of his own, been implicated in the involvement of Laban death and assuredly has a bounty out on his head as well as Nephi. At this point it’s already too late to turn back and so if he wants his life he has to disappear from Jerusalem. That’s some interesting thoughts on Zoram, I never pictured Zoram as an advisor to Nephi. Interesting indeed. Rob, I do believe that Nephi was commanded to slay Laban. I really do. I believe he had the spirit with him both then and subsequently. That is really separate from the question of whether or not this was a lawful killing. For instance, Numbers 35 gives a few examples of killings that are not murder or perhaps could even be considered justified. I struggle to find similar OT language that seems “on point” for this particular fact pattern. I’m certainly attempting to draw a distinction in my mind between “murder” as a sin and “murder” as a crime under the applicable legal system in Jerusalem circa 600 BC. I get the sense that you are not trying to draw that distinction. One problem for me is that there is substantial overlap at that time and place between God’s law and man’s law, since the Law of Moses was basically both. I am more comfortable with Nephi’s actions from a “sin” perspective then I am from a “legal” perspective. I still think it’s worth noting that we are taking Nephi’s word for this (he has no witnesses) and this is a fact pattern where most of us would immediately condemn the writer if we weren’t already heavily invested in believing his overall narrative. Setting all of that aside, I do think it’s possible to read the part about Zoram as follows, Zoram first met Nephi as follows: Nephi was impersonating Laban and wearing Laban’s bloody clothes and as soon as Zoram realizes that it’s not Laban Nephi tells Zoram that God commanded him to kill Laban and he did so. Zoram was presumably nothing short of shocked and in that state of shock had to almost immediately make a crucial life choice. Quite an interesting story. In Nephis day murder was always a sin and punishable by death. Biblical law set forth the laws or the framework of them. If we were to ask Nephi what murder is and if he murdered Laban he would probably laugh and say that Labans death was justifiable according to biblical law. In those days stealing, attempted murder, false accusations and even lying was a death sentence in certain instances. By their own law (minus corruption of kings and judges) Laban was guilty of all those crimes which was punishable by death. Rob (9), yes I agree with all that. But why does he stay with the Lehites even after he’s gone from Israel? There’s lots of places he could have fled to. I’m not criticizing him and I can think of possible scenarios (like he doesn’t know how to survive on his own in the wild or he’s simply a “go long with things” personality). He’s definitely a very strange case though. I’m just not satisfied with Nibley’s explanations. Rob (12), you don’t think God could have asked Nephi to do something against the law and punishable by death? I think one can think it was illegal yet still just. We all enjoy different things, but I would strongly recommend anyone interested in the topic of Nephi killing Laban to re-read (or read for the first time) the article. In Nephi’s case, it turns out that the place to which he could flee was the New World. I think part of the oath Zoram makes is to tarry with them from that time forth and in return he gets to ride with Lehis club on safari across the desert. Sounds like a blast to me. I honestly feel like Zoram felt liberated and thus drawn to Nephi. The killing of Laban is a test of faith for Nephi.Nephi passed the test. David, here’s another thought which struck me. The Brass Plates have the record of Lehi’s family tree. Why? Are Laban and Lehi related? If not, does Laban wrongfully have the plates? Perhaps he does in two instances: (1) he isn’t family or (2) he lives “wrongfully” and therefore has abdicated his right to them. If its wrong for him to have them, has he committed some kind of offense. Typically, it was the victim’s family who was doing the avenging under the Exodus chapter 21 provisions. If the “victim” is Lehi’s family, is Nephi in the right role of “avenger”. (Of course, I think James’ concern isn’t for the legal justification or “excuse” as he’d call it for simplicity’s sake, but for whether Nephi did something he regretted as if it was a sin.) More to come. Terry, The other alternative is that by genealogy they simply means Genesis something like we presently have it. I’m not saying there might not be an other type of genealogy mind you. Just that there are lots of alternatives. One I’ve entertained but is *very* speculative is that Lehi was descended of the sons of Moses and this suppressed priesthood in the post-exilic era. The plates differ from ours because they contain more of this tradition (thus Alma 11-14 we’ve discussed prior relative to Nephi) but also Lehi’s right to the priesthood. Put an other way it’s kind of like we all have our priesthood lineage in terms of ordination going back to Peter, James and John. Rob, I think there’s definitely an act of faith. How big a test it is I can’t tell. If Nephi’s going against what he thinks is wrong because God tells him that’s a big one. If Nephi’s simply squeamish and uncomfortable doing something he knows is right that’s a different sort of faith. I’m not sure the test is so much here with Laban as it was going back up to Jerusalem. Laban is more the fulfillment after he’s already passed the test in this reading. But of course it can definitely be read the other way too. N.W. Clerk: I’ll admit, I chuckled at your comment. In all seriousness, however, it was difficult to decide to post these entries. I didn’t craft them with an agenda for self-representation, but there’s no question that they reveal a great deal about me—about what strikes me as salient, what I value, my personal struggles and weaknesses, etc. Because they were written as a journal, I’m fairly candid. And as you hint, even that which I’m not candid about is vulnerable to analysis. I think this is a function of all good scripture when we approach it as scripture: it opens us up and acquaints us with ourselves—as well as with God. Clark: I’m glad you brought up the deception—I have a similar discomfort with the facts as portrayed. I don’t see a clear way out. Zoram did in fact take Nephi to get the plates and did join their venture, and Nephi does seem to have been wearing Laban’s clothes. But it’s almost a childish sort of deception story. If we bracket the possibility that the deception was miraculous, I’m not sure what to do. And I tend to think Dave’s right about marriage—the classic means of reconciliation and political binding. David: Yes, I think Nephi’s clearly drawing on the verses in Exodus and Deuteronomy—but this is the older Nephi. I think it more likely that he had never heard these verses before obtaining the brass plates (and who knows how long it was before he was genuinely familiar with them). Again, I think all of this argues for a very carefully crafted narrative, in response to the then current (i.e., older-Nephi timeframe) criticism. Incidentally, this is also another FARMS-style evidence of historicity; it strikes me as hugely implausible that Joseph Smith would’ve been familiar with these passages and so able to carefully craft a literary narrative built on them (I can’t remember if Welch makes that point or not). Clark: as noted in other posts, I think they had to have another genealogy than Genesis in mind—it’s conspicuous that this is Lehi’s originally articulated reason for obtaining the plates, and it’s also the first thing he searches the plates for—to get an accurate view of his own lineage. Also, while we don’t have solid evidence, the idea that Lehi considered himself part of the Moshivites seems more plausible than not (given his initial criticalness, willingness to leave Jerusalem, and immediately build an altar; plus the fact that we know he’s descended from Joseph not Aaron, Judah or Benjamin). The issue of genealogy seems very weird to me. It must be something in their plates different from our plates. Even though (as anyone who’s tried to read the Torah knows) genealogy was important for them. It pops up in very weird places. I don’t think we have enough information to know why this was such a big deal for them. Clark I know I take this up in chapter 5 though I honestly don’t remember what I say. At any rate, ancient scriptures were a fantastically arduous and time consuming affair — even as scrolls. No one owned them. Of course we have the famous discovery of Deuteronomy (assuming it was either of those things) in the temple. And hundreds of years later we have record of the scrolls being copied and kept in communal locations of worship. Perhaps Nephi had opportunity to hear some things read at the temple on feast days or some such but I doubt it. I don’t think those were family affairs — I doubt that most devout men had such opportunity let alone boys. I think theres more to the story in terms of the relationship between Lehi’s and Laban’s families / clans. First off, Laman gains an audience with Laban to make his initial request for the plates only to be threatened with death for attempted robbery. Then Nephi and his brothers gain a second audience with Laban. (I imagine Laman was quite nervous during this visit.). These are not visits in which they’re rebuffed at the door. 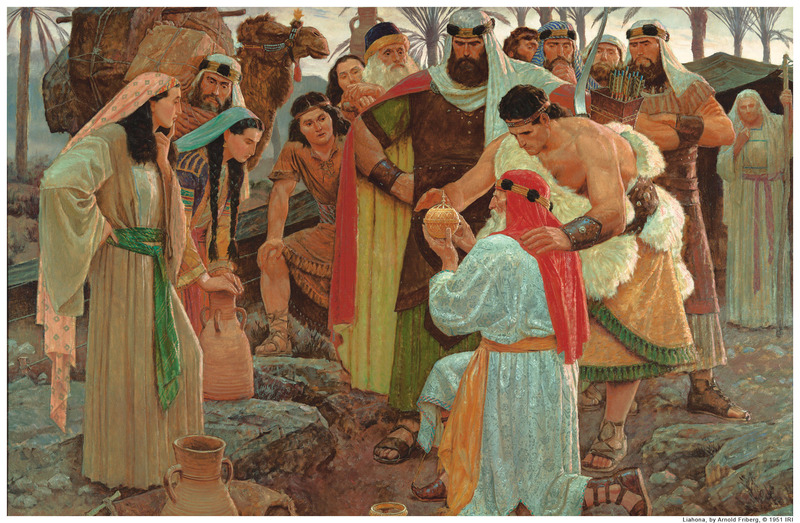 Nephi describes Laban as seeing their treasure and lusting after it. Laman seems familiar with the size of Laban’s forces. Nephi knows where the plates of brass are kept and where the treasury of Laban is. Nephi recognizes Zoram on the way to the treasury and knows that he has the keys. (I think this is more than just finding the custodian with the huge key ring at the high school.) I don’t think this is the first time they’ve met. What I find interesting about Nephi’s mentioning of Zoram bringing up the elders of the Jews is that Nephi has enough knowledge to maintain a credible conversation about the elders of the Jews. To me, this also tells something of Zoram’s role here. Common guards don’t need to have knowledge of the leaders of the community or of the church. I suspect Zoram’s role is more record keeper / scribe. I think there’s more in Zoram’s contribution to the story in this chapter as well as in the Book of Mormon narrative as a whole, but I need to think through that more. Thus I think there’s familiarity among these families. Evidently it’s not close family relations, as chapter 5 suggests Lehi wasn’t completely aware of his genealogy until he reads the brass plates. But I think this passage deserves continued close reading. Aaron, those are great points. I’ve not considered the fact that they were admitted and what that might say. I wish we knew about Laban, more of who he was, his position, his overall status in the community. Also, although the text makes it sound serendipitous, there’s no reason to think that Nephi didn’t already know who Zoram was and where to seek him out.